Natural and managed soils have been identified as the largest sources of atmospheric nitrous oxide (N2O). However, the quantification of N2O emissions from soils under natural vegetation in China and their possible responses to changing climate and atmospheric nitrogen deposition remains uncertain. In particular, information regarding N2O emissions from Chinese shrublands is lacking. 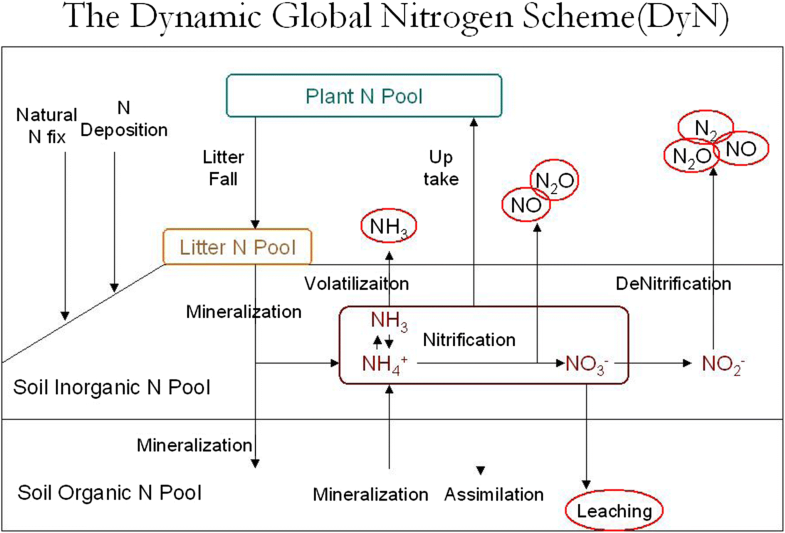 This study used 28 sets of N2O field measurements in China to validate a process-based dynamic nitrogen cycle model (DyN-LPJ), which was then used to investigate the N2O fluxes from soils under natural vegetation in China from 1970 to 2009. N2O emissions from Chinese forests, grasslands, and shrublands in the 2000s were estimated to be 0.10 ± 0.06 Tg N yr.−1, 0.09 ± 0.09, Tg N yr.−1 and 0.14 ± 0.07 Tg N yr.−1, respectively. Monthly N2O fluxes were linearly correlated with precipitation, and exponentially (Q10 = 3) with air temperature. The total N2O fluxes from natural terrestrial ecosystems in China increased from 0.28 ± 0.03 Tg N yr.−1 in the 1970s to 0.46 ± 0.03 Tg N yr.−1 in the 2000s. Warming and atmospheric nitrogen deposition accounted for 37% (or 0.07 ± 0.03 Tg N) and 63% (0.11 ± 0.01 Tg N) of this increase respectively. Our results indicate that when compared to grassland ecosystems, N2O emissions from forest and shrubland ecosystems contain larger uncertainties due to either their uncertain areal extent or their emission rates. Long-term and continuous field measurements should be conducted to obtain more representative data in order to better constrain shrubland N2O emissions. The online version of this article ( https://doi.org/10.1007/s11104-018-3856-6) contains supplementary material, which is available to authorized users. Nitrous oxide (N2O) is a potent long-lived greenhouse gas with a global warming potential that is nearly 300 times greater than that of carbon dioxide (CO2), and is a major contributor to stratospheric ozone destruction (Wuebbles 2009). Atmospheric concentrations of N2O have been increasing rapidly for a number of decades. Recent analyses indicate that the increase is caused by disturbance of the natural N cycle and associated N2O production through nitrification and denitrification (Ciais et al. 2014; Kroeze et al. 1999). Estimates of the global total emission from soils under natural vegetation vary from 3.3 to 9.9 Tg N yr.−1. This amount is similar to the sum of all anthropogenic sources, including agriculture (Ciais et al. 2014; Denman et al. 2007). The land area in China is approximately 9.6 × 1012 m2, accounting for 7% of the global terrestrial land area (Hou et al. 1982). The cropland area is about 1.68 × 1012 m2 according to Vegetation Map of China (VMC) (1:4000000) (Hou et al. 1982) (http://westdc.westgis.ac.cn) and accounts for 17.5% of the Chinese land area. N2O emissions from cultivated soils are most often estimated as the sum of two independent parts, i.e., background and fertilizer-induced emissions (Bouwman 1996; Bouwman et al. 2002; Stehfest and Bouwman 2006; Yan et al. 2003). The N2O emissions from Chinese cropland including background emissions have been estimated to be 0.15 Tg N yr.−1 by Chen et al. (2000), 0.37 Tg N yr.−1 (range: 0.29–0.47 Tg N yr.−1) by Cai (2012) and 0.34 Tg N yr.−1 (range: 0.17–0.51 Tg N yr.−1) by using the DeNitrification-DeComposition (DNDC) model (Li et al. 2001); The emissions at 0.20 Tg N yr.−1 (Yan et al. 2003) and 0.28 Tg N yr.−1 (range: 0.06–0.65 Tg N yr.−1) (Zheng et al. 2004) were also estimated, when excluding the background emissions. Large uncertainties still exist in the estimation of background emissions for China. For example, using the revised 1996 IPCC Guidelines for National Greenhouse Gas Inventories, Yan et al. (2003) estimated emissions at 0.13 Tg N yr.−1, while Li et al. (2001) estimated emissions at 0.18 Tg N yr.−1 using the DNDC model, and the emissions were 0.10–0.12Tg N yr.−1 based on observational data (Gu et al. 2007; Gu et al. 2009). Background N2O emissions across different soil types and climate regions are significantly regulated by the climate, but the current IPCC approach does not consider these effects (Gu et al. 2009; Lu et al. 2006).To date, a number of studies have estimated natural ecosystem soil N2O emissions. For example, a direct extrapolation from field studies estimated the emissions at 0.42 Tg N yr.−1 (Cai 2012), which were very similar to process-based models estimates of 0.44 Tg N yr.−1 (Lu and Tian 2013). 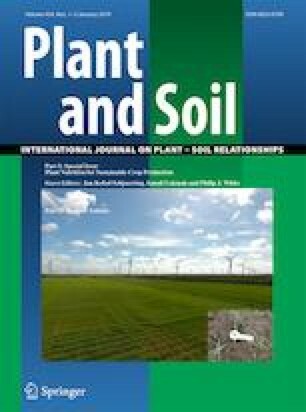 Emissions from Chinese unmanaged grassland soils were estimated ranging from 0.04 to 0.13 Tg N yr.−1 through direct extrapolations (Cai 2012; Chen et al. 2000; Huang et al. 2003) and using process-based models (Tian et al. 2011; Zhang et al. 2010). In contrast, the uncertainty range for Chinese forest soil emissions is much larger, ranging from 0.09 Tg N yr.−1 (Chen et al. 2000) to 0.29 ± 0.17 Tg N yr.−1(Cai 2012). In addition, the soil N2O emissions from Chinese shrubland has never been estimated as a separate entity (Cai 2012). These major uncertainties are from either uncertain natural vegetation coverage data or uncertain emissions rates for specific vegetation types. Especially for Chinese forest ecosystems, there are only a few soil N2O emission observations and even less for tropical and subtropical forest ecosystems before the 2000s. Atmospheric N deposition rates have dramatically increased with the increase of anthropogenic nitrogen use (Liu et al. 2013; Lü and Tian 2007). This increase in atmospheric N deposition may have altered the terrestrial N cycle by increasing the rates of the microbial processes nitrification and denitrification and thereby the leaching of soil mineral N, such as NO3− concentration and N2O emissions (Lu et al. 2011). Relatively little is known about how the increase in N deposition have altered N2O emissions from natural ecosystems in China. In this study we used a process-based dynamic nitrogen cycle model (DyN-LPJ) that has previously been comprehensively evaluated using 66 sets of measurements of total annual N2O emissions from global natural ecosystems (Xu-Ri et al. 2012). We used an additional 28 sets of measurements covering 18 sites of grassland and forest ecosystems in China to further calibrate the model. The calibrated model was then used to quantify the N2O emissions from the soils under natural vegetation and the background emissions from croplands in China. The contributions from grasslands, forests, and shrublands to total natural soil N2O emissions in China was analyzed and their emission responses to changing climate and atmospheric N deposition were quantified. DyN-LPJ (Xu-Ri and Prentice 2008) is based on the Lund–Potsdam–Jena (LPJ) dynamic global vegetation modelling framework (Sitch et al. 2003) (Fig. 1). In addition to the coupled carbon and water cycling and vegetation dynamics simulated in LPJ, DyN includes following sub-models: (1) plant N uptake, (2) plant N allocation, turnover, reproduction, and mortality, (3) plant and soil N mineralization, (4) biological N2-fixation, (5) nitrification, (6) NH3 volatilization, (7) nitrate leaching, (8) denitrification, and (9) N2, N2O and NO production and emission. Sub-model (2) uses an annual time step; the others use a daily time step. The model runs at a spatial resolution of 0.5° × 0.5° (Xu-Ri and Prentice 2008). N2O fluxes were modelled as byproducts of nitrification and denitrification. Nitrification is assumed to occur in aerobic microsites within the top 50 cm of soil, while denitrification is assumed to occur in anaerobic microsites within the same soil layer. Soil moisture (water filled pore space, WFPS) was used as an indicator to allocate substrates into two soil fractions with different aeration status. Nitrification and denitrification rates were then calculated directly from substrate availability (NH4+ for nitrification; labile C, NO3− and NO2− for denitrification) and soil environmental factors (soil temperature and WFPS). The rate of each transformation was regulated by the substrate concentrations (NH4+, labile C, NO3− or NO2−) following Michaelis–Menten kinetics and soil temperature. The detailed functions and parameters for nitrification and denitrification are documented in Xu-Ri and Prentice (2008). We applied the maximum fraction of N2O losses from nitrification and denitrification as 0.05% (RN2ON) and 1.8%(RN2ODN), respectively (Xu-Ri et al. 2012). Twenty-eight sets of measurements, covering 18 sites were used in this study for model evaluation (Fig. 2). As shown in Table 1, the first 5 sites have been used in a previous global-scale evaluation (Xu-Ri et al. 2012), the additional 23 sets of measurements of annual N2O emissions (covering 13 sites), conducted during the period 2003–2006, were used in this study for model calibration for grassland, forest, desert and alpine steppe ecosystems in China (Table 1, Fig. 2). These measurements were all conducted in the field, using closed chamber techniques and gas chromatography. Three gas flux measurement locations within each of the above sites were established randomly and N2O fluxes were typically measured at the same time period (usually mid-morning, 10:00–12:00 h) of each sampling day and 1–2 times per week during the growing season and 1–2 times per month during winter. The N2O fluxes were determined using opaque static chambers with subsequent analysis on a gas chromatograph (GC) fitted with an electron capture detector (ECD). In studies 6–22 and 24–28 the carrier gas used was nitrogen gas (N2). However, Zheng et al. (2008) showed that only using N2 as carrier gas can overestimate the N2O concentration. The reason is an interference of the presence of large concentrations of carbon dioxide (CO2) in the gas samples collected. To combat this problem ascarite was added to the carrier gas stream to remove the CO2 from the air samples. By comparing the N2 only (the DN method) with the N2-Ascarite method, Zheng et al. (2008) proposed correction terms for N2O flux measurements. Using the correction terms, we adjusted the N2O fluxes for studies No. 6–22 (Table 1). Emissions in study 24–28 had already been corrected by Gu et al. (2009), using the same method, and studies 1–5 and 23 did not require any correction. For comparison, annual N2O emissions were simulated at the geographic location of each site following the transient simulation protocol described below. The simulated results were compared with the specific grid cell location and specific year of each measurement. The simulated cropland background N2O emissions represent the potential natural soil N2O emissions in cropland areas. The transient model runs were set up using identical parameter values, model protocols and forcing to the simulations described by Xu-Ri et al. (2012) except that the transient runs were extended to 2009. TS 3.10.1 climate data (http://www.cru.uea.ac.uk/cru/data/hrg/) from the Climatic Research Unit and updated atmospheric CO2 concentration data from Keeling et al. (2009) were used. For a model spin-up period of 2000 years, we used climate input from 1901 to 1930. Thereafter, the model was run with transient monthly climate data from 1901 to 2009. These transient simulations were performed at both site level and national-scale. 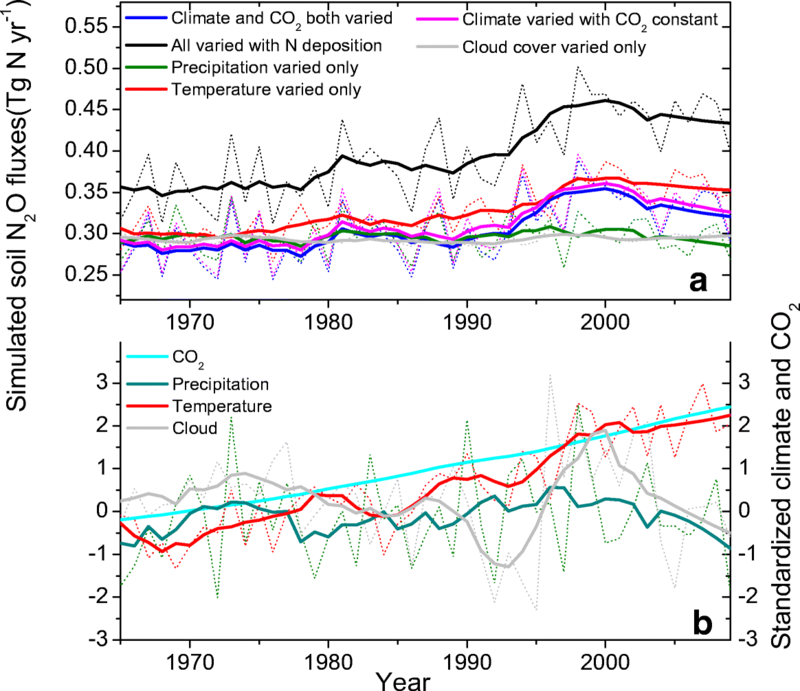 Six historic simulations were performed: (1) all factors including CO2, climate and N deposition varied throughout the twentieth century, (2) CO2 and climate varied without N deposition, (3) climate varied but kept CO2 constant, (4) only temperature varied, (5) only precipitation varied, (6) only cloud cover varied. In simulation (4), (5) and (6), CO2 was kept at 296 ppm, while the “fixed” climate variables were held at their 1901–1920 averages. Simulations were conducted for the period of 1901 to 2009. The simulations for the period 1970 to 2009 were analyzed. The atmospheric N deposition data for China for the years 1860 to 1993 were taken from Dentener (2006) and were linearly interpolated to daily time steps and extrapolated to the period after 1993. The datasets include annual N deposition rates for ammonium and nitrate and were added to the soil ammonium and nitrate compartment. This simple approach estimates the magnitude, trend, and distribution of N deposition during the twentieth century. We recognize these estimates will not realistically represent true N deposition dynamics but will allow us to approximately assess the effects of atmospheric N deposition on N2O emission rates. The land areas of natural terrestrial ecosystems in China were extracted from the Vegetation Map of China (1:4000000) (Hou et al. 1982) (http://westdc.westgis.ac.cn), as shown in Fig. S1 and Table 2. In this vegetation map, crop type includes the staple crops (rice, wheat, maize), economic crops, fruit orchards, and economic forests. Our 28 sets of measurements cover 18 sites (Fig. 2), comprising alpine steppe, alpine tundra, alpine meadow, alpine shrubland, alpine swamp, temperate desert, temperate steppe and temperate forest, tropical forest and subtropical forest (Table 1, No. 1–23). The remaining five sites were background emissions from cultivated soils (Table 1, No. 24–28). Simulated and observed annual N2O fluxes were highly correlated either with (R2 = 0.75, n = 28, p < 0.001) or without (R2 = 0.70, n = 28, p < 0.001) N deposition. However, the slope was closer to the 1:1 line when atmospheric N deposition was considered (slope = 0.94, as shown in Fig. 3), especially for the tropical and subtropical forest areas, and the background emissions from cultivated soils, where the N2O emissions rate was higher than 1 kg N ha−1 yr.−1(Table 1, Fig. 3). We compared the observed and simulated monthly soil N2O emissions (kg N ha−1 month−1) for two temperate grasslands in Inner Mongolia in 1998 and Haibei in 2004; and two tropical forests sites in Heshan in 2004 and DingHushan in year of 2005. The correlation coefficients of these measurement and model results are 0.93 (Inner Mongolia), 0.86 (Haibei), 0.65 (Heshan), and 0.68 (Dinghushan), respectively (Fig. 4). 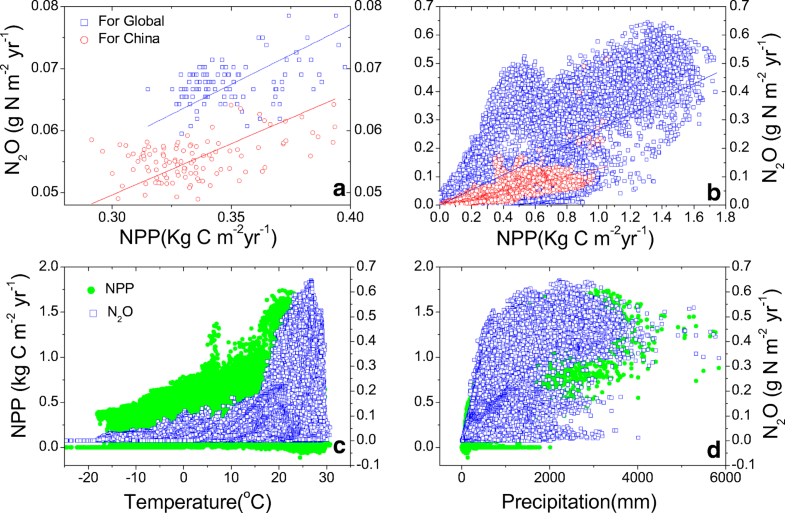 The model generally captured the seasonal variation of soil N2O emissions in monsoon climate regions of China, which is highly consistent with the precipitation seasonality (Fig. S2). N2O emissions correlated linearly and exponentially with precipitation and temperature on either monthly or annual time scale, respectively (Fig. 5). The linear and exponential correlation at monthly time step was significant (R2 = 0.64, R2 = 0.45, n = 96, p < 0.01). The exponential fit showed a Q10 (the factor by which the rate increases with a 10 °C rise in temperature) value of 2.99, with a temperature range between 10 °C and 20 °C. Our model simulations of N2O fluxes correlated well with temperature and precipitation at monthly and annually time scales. Large soil N2O emissions occurred when the soil moisture and temperature were high. Some of the discrepancies between modeled and simulated N2O fluxes on the monthly time scale were expected as the observation were conducted at the site scale while our climate data for driving the model are at 0.5° × 0.5° spatial resolution. Additionally, our model might have failed to capture the enhanced soil N2O emissions during spring thawing events and the soils N2O uptake during the non-growing season (Fig.4). N2O emissions were highest in the humid tropics but limited by low temperatures in temperate and boreal ecosystems, and by low soil moisture in the desert areas of China (Figs. 6a, b). Tropical and subtropical deciduous forests, shrubland, grassland and coniferous forests were predicted to emit 1.18 ± 0.67, 1.07 ± 0.21, 1.27 ± 1.08, and 0.60 ± 0.46 kg N2O-N ha−1 yr.−1, respectively (Table 2). The N2O emissions of temperate deciduous forests, shrubland, grassland, deserts, swamps and coniferous forests were predicted to be 0.28 ± 0.21, 0.41 ± 0.38, 0.47 ± 0.34, 0.16 ± 0.22, 0.21 ± 0.18 and 0.18 ± 0.07 kg N2O-N ha−1 yr.−1, respectively. Alpine grassland and meadow, with a very low emissions rate, were predicted to be 0.01 ± 0.10 kg N2O-N ha−1 yr.−1. The potential natural soil N2O emissions from the cropland area were predicted as 0.78 ± 0.47 kg N2O-N ha−1 yr.−1 (Fig. S3). When we aggregated the fluxes for different ecosystems according to their specific distribution maps (Fig. S1), we found that N2O emissions from shrubland played an important role either in temperate or in subtropical regions, because of their relatively larger distribution area when compared to forest and grassland (Fig. S4, Table 2). 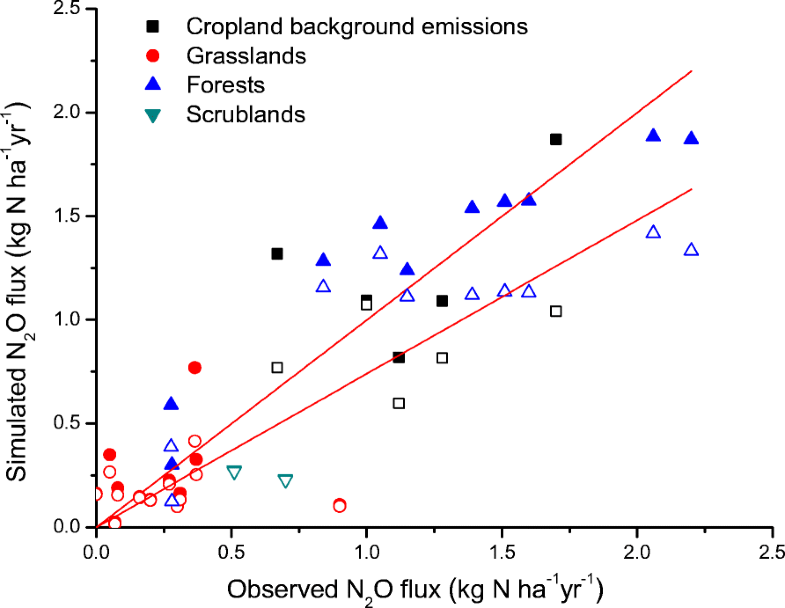 The total emissions from shrublands were 0.14 ± 0.07 Tg N, and N2O emissions from forest and grassland amounted to 0.10 ± 0.06 and 0.09 ± 0.09 Tg N, respectively (Fig. 7, Table 2). The potential background N2O emissions from cropland areas were 0.13 ± 0.08 Tg N (as shown in Table 2 and Fig. 7). The total amount of N2O emissions from the soil of natural terrestrial ecosystems in China in the 2000s was estimated to be 0.46 ± 0.30 Tg N with, and 0.35 ± 0.34 Tg N without N deposition (Table 2). The total amount of N2O emissions from natural terrestrial ecosystems in China increased from 0.28 ± 0.03 Tg N in the 1970s (average for 1970–1979) to 0.46 ± 0.03 and 0.35 ± 0.02 Tg N with and without considering N deposition, respectively, in the 2000s (average for 2000–2009). Warming and atmospheric N deposition accounted for 37% (or 0.07 Tg N) and 63% (or 0.11 Tg N) of the increase in N2O, respectively, while the effects of precipitation, cloud and atmospheric CO2 concentrations were negligible (Fig. 8). Atmopsheric N deposition rates during the period 2000–2010 (2000s) were estimated to be 8.36 ± 8.56 Tg N. The N deposition rates used were an average of 10.19 kg N ha−1 yr.−1and a maximum of 40 kg N ha−1 yr.−1 (Fig. S5). Their distribution patterns and magnitudes were closer to the observation based estimates of 12.89 kg N ha−1 yr.−1 by Lü and Tian (2007). The N2O increase resulting from atmospheric N deposition was 0.11 ± 0.01 TgN (Figs. 6a, b), with an average emission factor of 1.19% (Fig. S6). Similarly, the increase of 0.17 Tg N from Lü and Tian (2007) might be due to their higher estimated atmospheric N deposition for China. Satellite derived net primary productivity (NPP) has been used as an important variable to simulate global soil N2O emissions (Potter and Klooster 1998; Potter et al. 1996). In this study, we examined the relationships between the modeled N2O emissions and NPP on both spatial and temporal scales (Fig. 9). For China, spatially, the modeled soil N2O emissions (g N m−2 yr.−1) were highly correlated with NPP (kg C m−2 yr.−1) with a slope of 0.13 (R2 = 0.83, p < 0.001). Temporally, the correlations were also significant with a slope of 0.17 (R2 = 0.99, p < 0.001). N2O emissions from grassland ecosystems have been estimated in many studies, either by direct extrapolation, ranging from 0.04 to 0.13 ± 0.16 Tg N (Cai 2012; Chen et al. 2000; Huang et al. 2003), or via process-based model estimations, using either the DNDC model (0.08 ± 0.01 Tg N; Zhang et al. 2010), or the Dynamic Land Ecosystem Model (DLEM) model (0.10 ± 0.01 Tg N; Tian et al. 2011). Our estimation of 0.09 ± 0.09 Tg N falls within the above ranges; but from the perspective of the annual average emissions rate, the estimated value of 0.24 ± 0.23 kgN ha−1 yr.−1 (Table 3) is closer to the value of 0.22 ± 0.04 kgN ha−1 yr.−1 estimated by the DNDC model (Zhang et al. 2010). Our model estimates of N2O emissions from forest ecosystems were 0.10 ± 0.06 Tg N and were similar to the emissions of 0.09 ± 0.09 Tg N from grassland soils (Table 3). But, forest ecosystems cover a smaller area of China and per unit area therefore have a higher emission rate of 0.66 ± 0.42 kg N ha−1 yr.−1 compared to grasslands (0.24 ± 0.23 kg N ha−1 yr.−1). Our estimate is consistent with those of Chen et al. (2000), 0.10 Tg N, but much lower than that of Cai (2012), 0.29 ± 0.19 Tg N. The higher estimate of Cai (2012) may be partly because most of the N2O emissions in China during the 2000s were measured using the DN-method, as detailed in section “Model evaluation”. This study includes three observation sites in tropical and subtropical forests: Guangdong Heshan, Guangdong DingHuShan, and Yunnan Xishuangbanna (Table 1). The annual precipitation at these sites ranged between 1300 mm and 1900 mm, the annual air temperature between 17.5 °C and 22.0 °C, and annual N2O fluxes between 0.84 to 2.26 kg N ha−1 yr.−1(Table 1). These values fall within the range of N2O fluxes 0.88 to 4.36 kg N ha−1 yr.−1 for tropical forests worldwide (Stehfest and Bouwman 2006; Werner et al. 2007; Xu-Ri et al. 2012). Annual N2O emissions were generally less than 2 kg N ha−1 yr.−1 when annual precipitation was lower than 2000 mm and annual temperature was lower than 22 °C (Xu-Ri et al. 2012) (Fig. S7). However, there are still large uncertainties in N2O emission estimates for tropical forests in China. For example, emissions ranging from 2.7 to 3.4 kg N ha−1 yr.−1 have been reported based on short-term observations (Zhu et al. 2013). Future long-terms and year-round continuous measurements are needed to reduce these large uncertainties. N2O emissions from the shrubland ecosystems are not well researched globally and have not previously been estimated for China. In this study, after model calibration against forest and grassland ecosystems in China, N2O emissions from shrubland ecosystems were calculated at 0.14 ± 0.07 Tg N, in which temperate shrublands contributed 0.05 ± 0.05 Tg N (with an average annual N2O emissions of 0.41 ± 0.38 kg N ha−1 yr.−1) and tropical/subtropical shrubland contributed approximately 0.09 ± 0.02 Tg N (with annual emissions of 1.07 ± 0.21 kg N ha−1 yr.−1) (Table 3). Recent N2O flux measurements from an alpine shrub meadow in China ranged from 0.18 to 0.27 kg N ha−1 yr.−1 (Fu et al. 2018) and falls within our uncertainty range for temperate shrubland. The values for the temperate shrublands are also roughly consistent with those from European temperate shrublands (0.14 to 0.42 kg N ha−1 yr.−1; Carter et al. 2012). Background N2O emissions are defined as emission from cultivated soil that has not received nitrogen fertilizer during the current season or year (Gu et al. 2007; Zheng et al. 2004). The background N2O emissions from croplands may originate from the following nitrogen sources: natural microbial nitrification and denitrification processes from soils driven by natural N fixation; atmospheric N deposition, mineralization of soil organic matter or crop residues (Gu et al. 2007). Bouwman (1996) reported a background emissions rate of 1.0 kg N ha−1 yr.−1, which was based on five sets of field observations conducted in European and American unfertilized grasslands. The spatial variation of background N2O emissions proved to be highly climate dependent (Gu et al. 2009; Lu et al. 2006). In the present study, background N2O emissions from cropland are referring to the potential natural soil N2O emissions on cropland areas. After calibrating against the site scale observations (Gu et al. 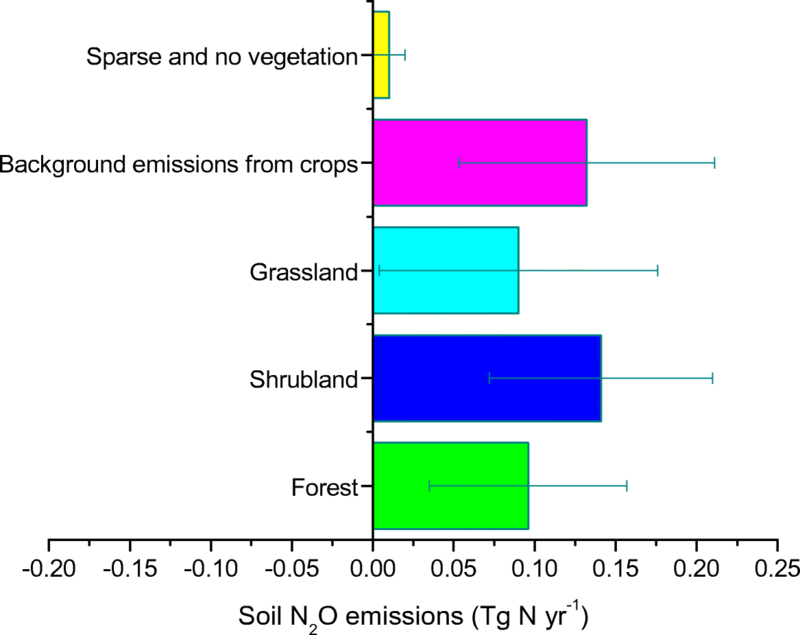 2009), we estimated an average background N2O emission from cropland of 0.13 ± 0.08 Tg N (Fig. 7, Table 3), with an average flux rate of 0.79 ± 0.47 kg N ha−1 yr.−1 for the period 2000 to 2009. This result falls within the uncertainty range of 0.72–1.66 kg N ha−1 yr.−1 reported by previous studies (Li et al. 2001; Gu et al. 2009) and is close to the IPCC default value of 1 kg N ha−1 yr.−1 (Lu et al. 2006). Our estimate of average N2O emissions from natural terrestrial ecosystems using the model DyN-LPJ was 0.46 ± 0.23 Tg N for the period 2000 to 2009. This estimate is comparable with a previous estimate of 0.44 Tg N, calculated from the difference between total terrestrial ecosystem emissions (0.81 Tg N) and those from N fertilized soils (0.37 Tg N) in China (Lu and Tian 2013). Cai (2012), estimated a similar value of 0.42 Tg N for total emissions from terrestrial ecosystems, but only forest and grassland emissions and not background emissions from croplands were included (Table 3). Since the1970s, the average N2O emissions from natural ecosystems have increased from 0.28 to 0.46 Tg N yr.−1 in the 2000s. These values are similar to even exceed the changes of agricultural fertilizer induced emissions, which were about, 0.10 in the 1980s (Gao et al. 2011), 0.28 Tg N yr.−1 in the 1990s (Lu et al. 2006; Zheng et al. 2004) and 0.31 Tg N yr.−1 in the 2000s, primarily due to global warming and the increasing rates of atmospheric N deposition (Fig. 8). 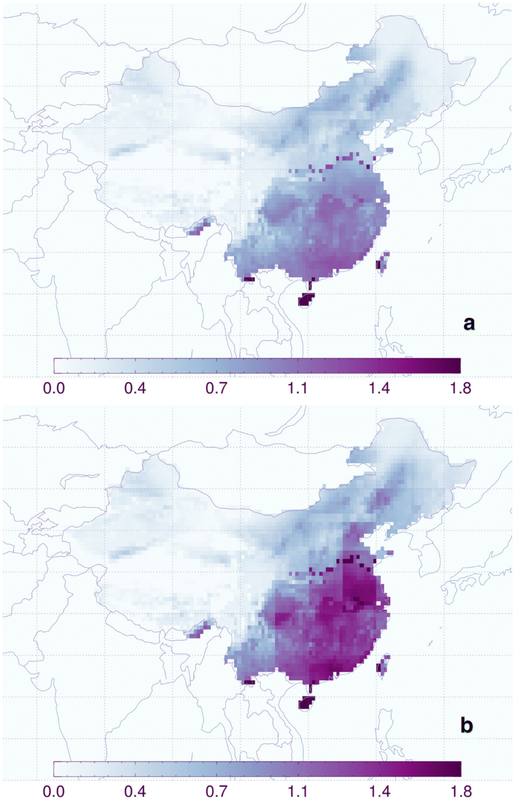 Our model simulations assume a constant land area for terrestrial ecosystems in China. The Vegetation Map of China (1:4000000) (http://westdc.westgis.ac.cn) represents the potential distribution of Chinese terrestrial ecosystems during the 1970s. However, the land areas of grassland, forest and cropland are not constant. Remote sensing products indicate that, during the 2000s, the Chinese cropland area had decreased, and forest and grassland areas had expanded. The limited data of changes in Chinese shrubland areas with time, have shown that Chinese cropland areas decreased from 1.68 × 1012 to 1.36–1.54 × 1012 m2 (Liu and Tian 2010; Xiu et al. 2014), while grasslands areas increased from 3.70 × 1012 to 4.03–4.20 × 1012 m2 (He and Shi 2015; Xiu et al. 2014), and forest areas from 1.46 × 1012 to 1.63 ± 0.22 × 1012 m2 (Liu and Tian 2010; Wang et al. 2015) (Table 4). These changes in land areas are related to the Chinese national policy of “returning cropland to forest and grassland” and ecological environment restoration (He and Shi 2015). The N2O emission estimates calculated from the new land area extent during the period of 2000s for grassland, forest and cropland suggest that the increasing N2O emissions due to increasing grassland and forest areas, might be offset by decreasing background emissions due to decreasing cropland area (Table 4). However, the overall estimates still fall within the uncertainty range of our estimates based on constant land area for various types of ecosystems. Here we also examined vegetation area differences between various data sources (Table S1). The vegetation area of shrubland used in this study are 2.07 × 1012 m2 based on the VMC (1:4000000), which is closer to the shrubland area of 2.15 × 1012 m2 used in Piao et al. (2009) and 2.09 × 1012 m2 according to the VMC (1:1000000) in Wang et al. (2017). We observed a large discrepancy in natural vegetation area extent between VMC and GLC 2000. Especially for the shrublands area, a large decrease in shrublands is obviously due to a systematic mismatch between two sources, VMC is mainly based on the field survey and the GLC2000 is mainly derived from the remote sensing production. Consequently, the large uncertainties in shrubland N2O emissions come from land area uncertainties for various ecosystems, while the limited amount of observational data of N2O emissions also contributed to the uncertainty of model extrapolation. 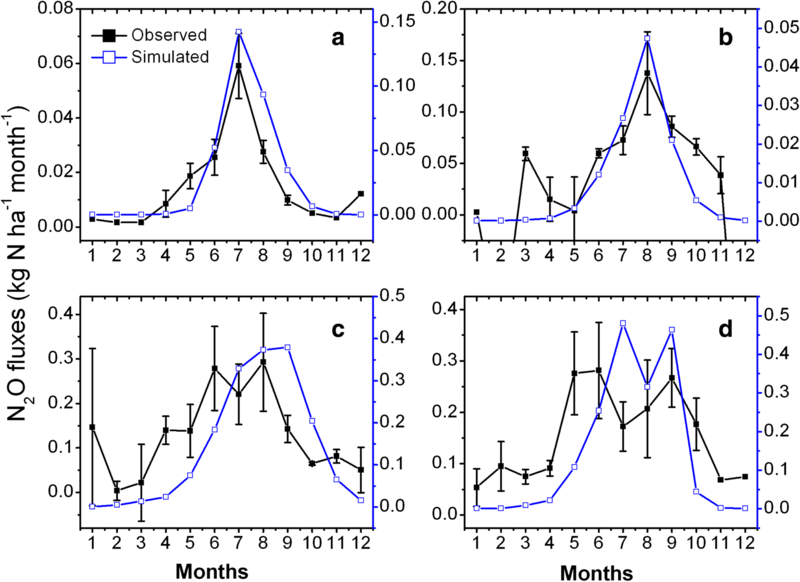 The observed soil N2O fluxes were found to be significantly correlated with precipitation and temperature at seasonal and annual time scales (Fig. 5), which is consistent with other field studies (Smith et al. 2018). Nitrous oxide is produced naturally through nitrification and denitrification by soil microorganisms. Nitrification is an aerobic process in which ammonium (NH4+) is oxidized to nitrate (NO3−) and with nitric oxide (NO) and N2O as byproducts. Denitrification is an anaerobic process in which NO3− is reduced to the denitrification products N2O and N2. In the DyN-LPJ model, soil moisture (represented as water filled pore space, WFPS) is used as an indicator of N2O production rates by either nitrification or denitrification pathways (Xu-Ri and Prentice 2008). The close correlation between WFPS and N2O emission rates is supported by many field observations (Bai et al. 2014; Fu et al. 2018; Gütlein et al. 2018). The fraction of N2O loss from gross denitrification can be 10 times larger than the maximum rate of N2O production from nitrification processes (Xu-Ri and Prentice 2008). Both nitrification and denitrification process are highly temperature-dependent, with a Q10 value of ~2.0 to 4.0 over the range 15–25 °C. The exponential relationship between temperature and N2O production has been well documented in field studies (Griffis et al. 2017; Song et al. 2018; Zhou et al. 2018). The above discussed empirical relations were implemented in the DyN-LPJ model (Xu-Ri and Prentice 2008). 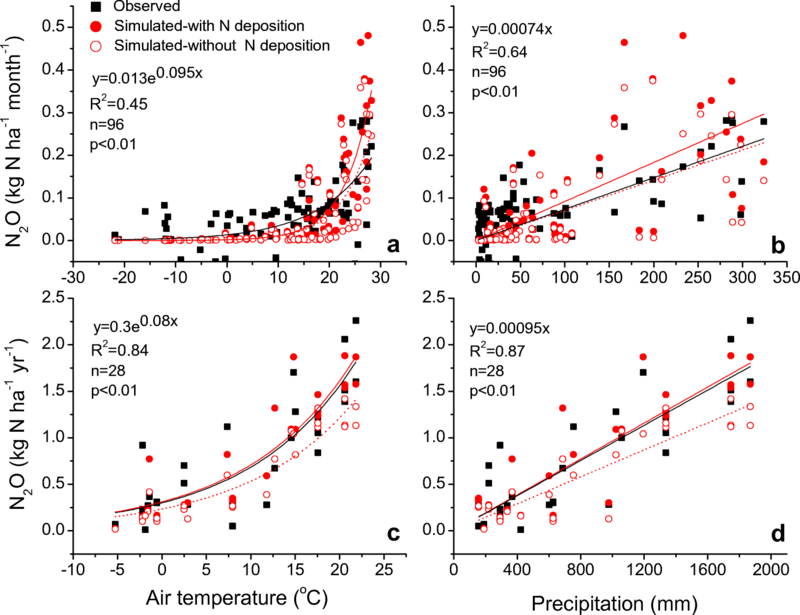 Nitrous oxide fluxes were nonlinearly controlled by both precipitation and temperature (Fig. 9, Fig. S7) at the global scale and for China. However, the N2O fluxes cannot be simply predicted by either of these single factors (Fig. 9, Fig. S7). The net primary productivity of CO2 (NPP) was distributed similarly under the control of precipitation and temperature on the spatial scale (Fig. 9). These results verify the findings of a previous study in which satellite-derived NPP was used to predict global N2O emissions (Potter et al. 1996). More recently, a close correlation between ANPP (Aboveground Net Primary Productivity) and N2O fluxes was also observed in a field study (Zhang et al. 2018); The underlying mechanism is that ecosystem N loss (e.g., N2O emissions) is affected by the rate of N fixation, while the NPP is one of the good indicators for the ecosystem scale N fixation (Xu-Ri and Prentice 2017). However, the correlation coefficients need to be calibrated locally according to local measurements when the upscaling of N2O emissions is based on NPP data. On the temporal scale, however, NPP is a less reliable predictor, both globally and for China, because NPP more strongly responds to the increasing CO2 concentration (Cramer et al. 1999; Xu-Ri et al. 2012). On a decadal timescale, temperature appeared to be the dominant factor for natural soil N2O emissions (Fig. 8). This could be due to the fact that in the twentieth century, there was no significant variation in annual precipitation, whereas the air temperature has significantly increased in China (Fig. 8). This study compiled 28 sets of measurements of N2O emissions from natural ecosystems in China, including temperate grassland, alpine grassland, temperate forest and tropical forest. The process-based dynamic nitrogen cycle model, DyN-LPJ, was calibrated using these data. The verified model captured observed seasonal and annual variability of N2O fluxes and their significant correlations with precipitation and temperature very well. For the whole of China and globally a close correlation between NPP and soil N2O fluxes from natural ecosystems became evident. The average N2O emissions from natural terrestrial ecosystems in China during 2000–2009 were estimated to be 0.46 ± 0.30 and 0.35 ± 0.34 Tg N with and without atmospheric N deposition effects, respectively. N2O emissions resulting from atmospheric N deposition was estimated to be approximately 0.11 ± 0.01 Tg N. The total Chinese natural terrestrial ecosystem soil emissions account for 5.0% of global N2O emissions from natural soil sources. Shrublands may contribute to one-third of the total natural terrestrial ecosystem soil N2O emissions in China, however are also the most uncertain in terms of areal extend and N2O emission rates. Our uncertainty analysis suggests that long-term and continuous field measurements should be conducted to obtain more representative flux data to better constrain model estimates. This research was funded by the National Natural Science Foundation of China (40605032, 41175128, 41575152, 41775161), and the Strategic Priority Research Program – Climate Change: Carbon Budget and Related Issues of the Chinese Academy of Sciences (XDA05020402, XDA05050404-3-2). Strategic Priority Research Program of Chinese Academy of Sciences, Grant No. XDA20050102, XDA2005010202. Xu-Ri gratefully acknowledges the support of the China Scholarship Council (201704910347) and the logistics support from Purdue University. The transient model simulation results described in this paper are obtained on the“Era”petascale supercomputer of Computer Network Information Center of Chinese Academy of Sciences. The model input climate data were obtained freely from the TS 3.10.1 climate dataset of the Climatic Research Unit(http://www.cru.uea.ac.uk/cru/data/hrg/), the Chinese vegetation map used for land classification were freely obtained from Environmental and Ecological Science Data Center for West China, National Natural Science Foundation of China (http://westdc.westgis.ac.cn). Global maps of atmospheric nitrogen deposition, 1860, 1993, and 2050, Data set. Available on-line [http://daac.ornl.gov/] from Oak Ridge National Laboratory Distributed Active Archive Center, Oak Ridge, Tennessee, USA. The field observation data in this study has been acquired in collaboration with Prof. Yuesi Wang and Dr. Yinghong Wang (wys@mail.iap.ac.cn;wys@dq.cern.ac.cn). The data set used or produced from this study and used in this paper can be obtained from the corresponding author(xu-ri@itpcas.ac.cn).